Windows 10 Quick Tips – 32-bit or 64-bit? This will undoubtedly be the quickest Quick Tip in Windows 10 Quick Tips history. I always begin these little posts thinking they will be, well, quick. It doesn’t always end up being that way because sometimes I get long-winded, or sometimes the subject matter simply demands more attention. This particular Quick Tips article will, indeed, be quick. 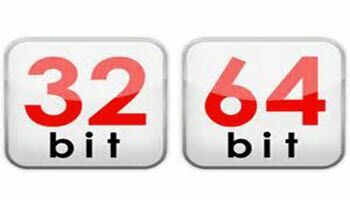 32-bit or 64-bit– Which Windows System Are You Running? You will have to bring up the System Properties Sheet for your computer and this can easily be done by using the Windows Key + X hotkey combination and choosing System from the Power Menu. You will immediately be presented with the above window showing you, among other things, which system type your are running. My stupid HP brings up the ‘Windows Mobility Center customized by Hewlett-Packard’ screen with the Winkey+X combination. There ought to be a law! HP loves to do that stuff; I usually disable all of it. When they start remapping native Windows hotkeys, that’s where I draw the line. Works great or right click in the lower left hand corner also. Right-clicking the Start Button also brings up the same menu as the WinKey + X hotkey. Much easier than drilling through the whole menu system. Thanks, I’m running Win 10 pro and the display shows 32 bit Operating system, x64 based processor. Is it possible to move from 32 bit to 64 bit Win 10? And if so how? You cannot directly upgrade Windows 32-bit to Windows 64-bit. You will have to buy the 64-bit operating system and install it. Windows key and Pause button. Always has been.